Permissions give users privileges, such as access to pages. Permissions are assigned to user roles. Users receive permissions when they are assigned to a user role. When a permission is toggled off for a user role, users with that role will notice that the buttons, links and tabs associated with that permission are read-only, missing, or grayed out. Click Manage Roles and Permissions. The Roles and Permissions pop up opens. 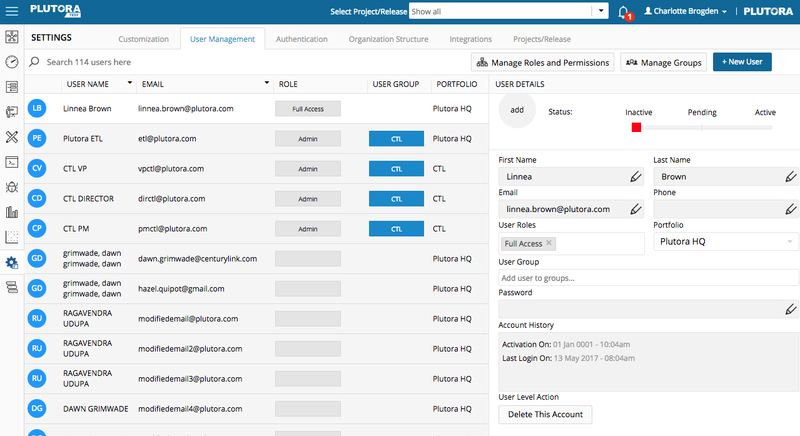 Once you have created a User Role, you can edit it and start adding permissions. Permissions are assigned to User Roles, then User Roles are assigned to Users. Click a Role in the left-hand panel. Click to open permissions folders in the right-hand panel. Click to select the blue checkboxes on the left of the permissions folders to assign permissions to the User Role. Click the blue checkbox next to the permission folder to assign or remove all permissions from that folder at once. Click the red cross next to the Role. Roles with an i are system defined and cannot be deleted. Defects View: Allows users to view the Defects page. Users without the permission will see an error message. Defects Create: Allows users to click + Add defect on the Defects page and add a new Defect. Defects Update: Allows users to click the blue-linked Defect ID or Name on the Defects page and edit a Defect. Defects Delete: Allows users to delete a Defect from the Defects page by selecting Delete from the right-hand menu or by clicking the blue-linked Defect ID or Name on the Defects page and then clicking the red trash bin icon. Defects Duplicate: Allows users to duplicate Defects on the Defects page by selecting Duplicate from the right-hand menu. Defects Bulk Update: Allow users to bulk update Defects on the Defects page by clicking the Bulk Update button. Attachments View / Download: Allows users to download attachments in the areas of Plutora Test that they have permission to use. Attachments Access: Allows users to view attachments in the areas of Plutora Test that they have permission to use. Attachments Create: Allows users to add attachments in the areas of Plutora Test that they have permission to use. For example, to add Defects attachments, users need the Attachments Create AND the Defects View user permissions. Attachments Delete: Allows users to delete attachments in the areas of Plutora Test that they have permission to use. For example, to delete Defects attachments, users need the Attachments Delete AND the Defects View user permissions. Comments View: Allows users to view comments in the areas of Plutora Test that they have permission to use. For example, to view Defect comments, users need the Comments View AND the Defects View user permissions. Comments Create: Allows users to add comments in the areas of Plutora Test that they have permission to use. For example, to add Defect comments, users need the Comments Create AND the Defects View user permissions. Comments Update: Allows users to update comments in the areas of Plutora Test that they have permission to use. For example, to edit Defect comments, users need the Comments Update AND the Defects View user permissions. Users without the permission will see an error message. Leaderboards View: Allows users to view the Leaderboards page. Users without the permission will see an error message. This feature is currently hidden. Requirement Create: Allows users to click + New Requirement on the Requirements page and add a new Requirement. Requirement Update: Allows users click the blue-linked Requirement Name on the Requirements page and edit a Requirement. Requirement View: Allows users to view the Requirements page. Users without the permission will see an error message. Requirement Delete: Allows users to delete a Requirement from the Requirements page by selecting Delete from the right-hand Action menu or by clicking the blue-linked Requirement Name and clicking the red trash bin icon. Requirement Create – Bulk Upload: Allows users to bulk upload Requirements on the Requirements page by clicking the Bulk Upload button. Requirement Bulk Update: Allow users to bulk update Requirements on the Requirements page by clicking the Bulk Update button. Test Case View: Allows users to view the Test Case area of the Test Designer page. Users without the permission will see an error message. Test Case Update: Allows users to edit a Test Case in the Test Designer page by clicking the pencil icon. Test Case Delete: Allows users to delete a Test case in the Test Designer page by clicking the black X. Test Case Create: Allows users to add a Test case in the Test Designer page by clicking + Add New. Test Case Execution View: Allow users to view the Test Execution page. Users without the permission will see an error message. Test Case Execution Execute: Allows users to execute Test Cases on the Test Execution page by clicking the Run new Test button. Test Case Execution Create – Bulk Upload: Allows users to bulk upload Test Cases on the Test Designer page by clicking the Bulk Upload button. Test Case – Bulk Update: Allow users to bulk update Test Cases on the Test Designer page by clicking the Bulk Update button. Test Design View: Allows users to view the Test Designer page. Users without the permission will see an error message. Test Plan Create: Allows users to add a Test Plan in the Test Plan page by clicking the + New Test Plan button. Test Plan Update: Allows users to edit a Test Plan in the Test Plan page by clicking the blue-linked ID or Name. Test Plan View: Allows users to view the Test Plan page. Users without the permission will see an error message. Test Plan Delete: Allows users to delete a Test Plan in the Test Plan page. Analytics Viewer: Allows users to only view and export the Plutora-created reports in Plutora Analytics that they have permission to view. Users cannot create projects or edit reports. Analytics Analyst: Allows users to create workbooks in the folders that have been created for them by the Analytics Admin. Analytics Admin: Gives users the same priviledges as Analytics Analyst, plus the ability to create folders under the Shared Workbooks Project, and access to add, edit, and delete those folders and their contents. They cannot delete or rename Plutora-created projects (folders). Settings > User Management tab > Click Manage Groups > Click the red X. User Roles View: Allows users to view the User Roles pop up. Users without the permission will see an error message. Settings > User Management tab > Click Manage Roles and Permissions > Click the red X next to a role. Custom Fields View: Allows users to view the custom fields in Customizations. Users without the permission will see an error message.